Kirkuk Fight: Iraq Sends Troops To Take City And Oil Fields Back From Kurds : The Two-Way Kurdish media outlets quoted the Peshmerga General Command as calling the attack "a flagrant declaration of war against the nation of Kurdistan." 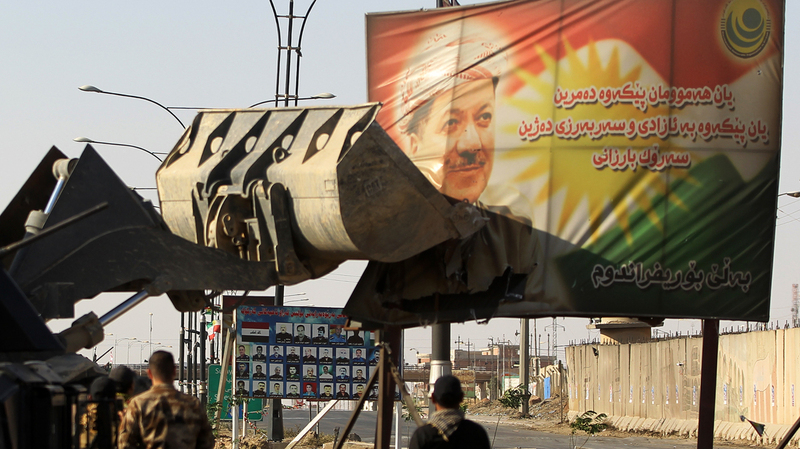 Iraqi forces use heavy equipment to damage a poster of Iraqi Kurdish President Massoud Barzani on the southern outskirts of Kirkuk, as Baghdad seeks to take control of the city from the Kurds. Iraqi forces took over key positions in the Kurdish city of Kirkuk and nearby oil-rich areas on Monday, after Prime Minister Haider al-Abadi said he ordered troops sent in because Iraq is in danger of "partition," citing the Kurdish independence movement. Abadi also ordered the Kurdish flag to be taken down and the Iraqi flag to be raised in disputed areas — and that's what happened at the governor's office and in other official buildings. Kurdish media outlets quoted the Peshmerga General Command calling the attack "a flagrant declaration of war against the nation of Kurdistan." Civilians have been fleeing the area, seeking safety in an increasingly perilous situation in northern Iraq. Many of them were heading to the Kurdish capital of Irbil, about 60 miles to the north, according to reporter Jenan Moussa of Al Aan TV. Early targets for Iraq's military included the Kirkuk military airport and several oil fields, according to multiple media reports. Amid reports that fighters with Kurdish security forces, known as the Peshmerga, were withdrawing, Kurdish media outlet Rudaw, which is supported by the Kurdistan Democratic Party, quotes a Peshmerga commander in Kirkuk as saying there was no collusion or error — and that the move was made to preserve life. "The Iraqi forces outnumbered the Peshmerga," commander Jaafar Sheikh Mustafa said, according to Rudaw. Speaking with NPR's All Things Considered on Monday, New York Times reporter David Zucchino said Iraqi forces had managed to split the Kurds, getting one faction to stand down during the fight. "They had managed to split the Kurds by cutting a deal with one faction of the Kurds to have them pull back and let government forces come through," Zucchino tells NPR. Iraqi forces flash victory signs as they advance toward Kirkuk. Iraqi forces clashed with Kurdish fighters near the disputed city, seizing a key military base and other territory in a major operation sparked by a controversial independence referendum. "Because half of the Kurdish factions just kind of surrendered and withdrew, it made it very easy for the Iraqi forces, the government forces to really sweep through very quickly," he said. The State Department on Monday issued a statement saying the U.S. was "monitoring the situation closely" and calling on all parties "to coordinate military activities and restore calm." "We support the peaceful exercise of joint administration by the central and regional governments, consistent with the Iraqi Constitution, in all disputed areas," State Department spokesperson Heather Nauert said. "We strongly urge all parties to avoid provocations that can be exploited by Iraq's enemies who are interested in fueling ethnic and sectarian conflict," she said. Pentagon spokesman Col. Rob Manning called the confrontation a "distractor" to the U.S. goal of destroying ISIS and said Iraqi security forces and Kurdish peshmerga should not be "going at each other." Sen. John McCain, chairman of the Senate Armed Services Committee, called on Iraq to stop the operation. He said in a statement: "The United States provided equipment and training to the Government of Iraq to fight ISIS and secure itself from external threats — not to attack elements of one of its own regional governments, which is a longstanding and valuable partner of the United States." McCain added, "Make no mistake, there will be severe consequences if we continue to see American equipment misused in this way." Iraq's military move comes three weeks after Kurds held a controversial independence referendum in which more than 90 percent of residents in the autonomous Kurdish region voted to split from Iraq. The U.S. had urged Kurdish leaders not to hold the vote. "This oil-rich province fell under Kurdish control in 2014, after Iraqi troops fled in the face of an offensive there by the extremist group ISIS. Now, the Iraqi government wants the territory back. 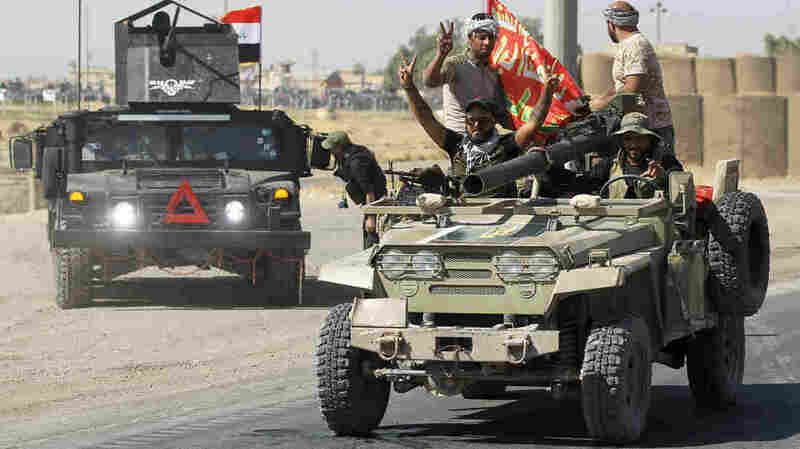 "Iraq's prime minister, Haider al-Abadi, said troops were under instructions to 'protect all citizens' as they advanced into the area, and Iraqi forces are said to have been told to avoid violence. But some residents reported hearing gunfire and explosions in the early hours of the morning. "The hostilities mark a real challenge for the United States, which has armed and trained both Iraqi troops and Kurdish Peshmerga fighters." "We are very concerned by reports of violence in Kirkuk and deplore any loss of life," the U.S. Embassy in Baghdad said on Monday. Calling on all parties to cease hostilities, the embassy added in an official statement, "ISIS remains the true enemy of Iraq, and we urge all parties to remain focused on finishing the liberation of their country from this menace." The Kurdish Regional Security Council says the operation began just before midnight and involved both Iraqi forces and Iran-backed militia fighters, "using U.S. military equipment, including Abrams tanks and Humvees." The council said that the Kurdish Peshmerga "destroyed at least five U.S. Humvees used by PMF." Of the new clash, Abadi said on Monday that he's trying to protect Iraq's constitution, repeatedly citing the independence referendum in a Facebook post about the military action. Kurd's leaders, he said, had failed to heed warnings against "the division of Iraq and the establishment of a state on an ethnic and racial basis." "We assure our people in Kurdistan and in Kirkuk in particular that we are keen on their safety and best interest. We have only acted to fulfill our constitutional duty to extend the federal authority and impose security and protect the national wealth in this city, which we want to remain a city of peaceful coexistence for all Iraqis."